LONDON, Jan. 31, 2019 /PRNewswire/ -- reach4entertainment enterprises plc (AIM: R4E), the entertainment marketing communications group, today announces that it has signed an agreement to acquire 50% of the issued share capital of Buzz 16 Productions Limited ("Buzz 16"). The total consideration for the shareholding will be satisfied through r4e's existing cash resources and the Board expects the acquisition to be earnings accretive in 2019. 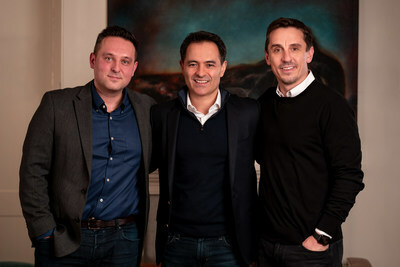 Buzz 16, which was founded in 2016, creates both short and long form sports orientated content and is co-owned by shareholders including former Manchester United player and respected broadcaster, Gary Neville, along with former Sky Sports Premier League producer, Scott Melvin. Buzz 16 has been responsible for a number of hit sports-related productions in recent years, including "Class of 92: Full Time", which became Sky Sports most downloaded series in 2018, and the International success "SoccerBox". The partnership with Buzz 16 marks an exciting point for r4e, with the Group taking its first major step to broaden its media and marketing communications capabilities beyond stage and theatre and now gaining exposure to the wider area of live entertainment and sport. This acquisition will bring together Buzz 16's strong in-house production capabilities and impressive network of both emerging and established sporting talent with r4e's multi-disciplinary approach to media and marketing services. With nearly 30 years of experience in entertainment marketing, r4e will work with Buzz 16 to expand its commercial offerings to sporting talent, clubs, brands and media houses, through optimised strategies across traditional and digital communications, experiential, partnerships and sponsorship. Gary, Scott and the Buzz 16 team will continue to develop cross-platform original content but will further expand Buzz 16's offering by partnering with r4e and its management team to diversify into new marketing-focused verticals. CEO of r4e Marc Boyan will join Gary & Scott as Directors of the Buzz 16 and will take an active role in building out combined capabilities. Commenting on the acquisition, Marc Boyan, CEO of R4E, said: "We are delighted to be working with Gary, Scott and the team as Buzz 16 embarks on its next phase of growth. Our investment in Buzz 16 was the culmination of a competitive process and is testament to the fact that our vision for the Group has broad appeal. This exciting partnership brings with it a number of important synergies. While it will provide r4e with exposure to the sports media sector, we see a great opportunity to help Buzz 16 develop a marketing services offering and provide leading brands with powerful strategies to meaningfully engage with their audiences across sponsorship, talent partnerships, experiential and sports marketing. We believe Buzz 16 will be a valuable addition to the r4e family." "We are proud to produce engaging content of the highest quality, so welcoming r4e's marketing communications expertise and network is the next natural stage to strengthen our proposition and ultimately broaden our offering to a wider audience. We started Buzz 16 to give people the chance to engage with sports and live entertainment in a different way so this partnership means we can do more of that. Having spent a lot of time with Marc, I am excited by his plans for the Group as well as his forward thinking approach to providing a differentiated and value enhancing service to clients."